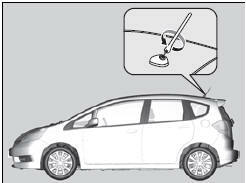 Your vehicle is equipped with a removable antenna at the rear of the roof. Before using a “drive-through” car wash, remove the antenna by unscrewing it by hand. This prevents the antenna from being damaged by the car wash brushes.